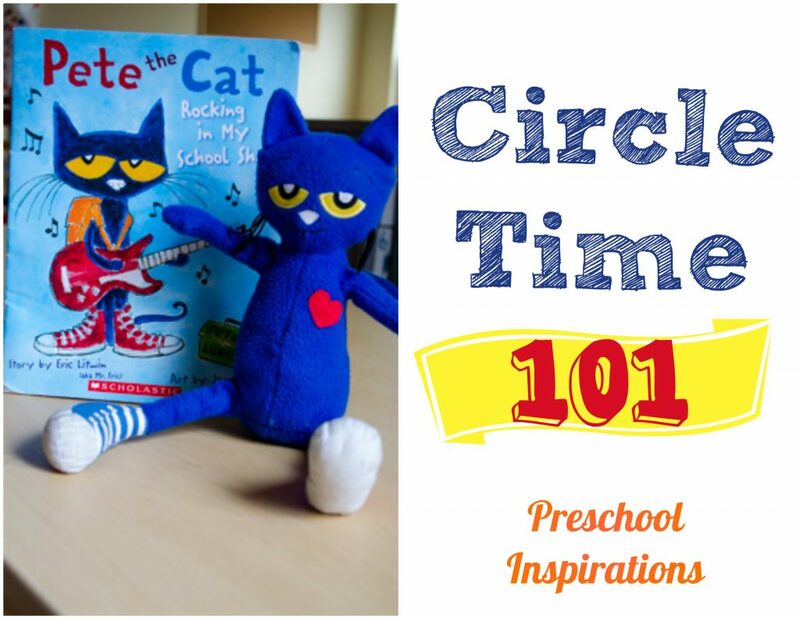 Are you planning circle time activities, or are you looking to revamp your circle time ideas? 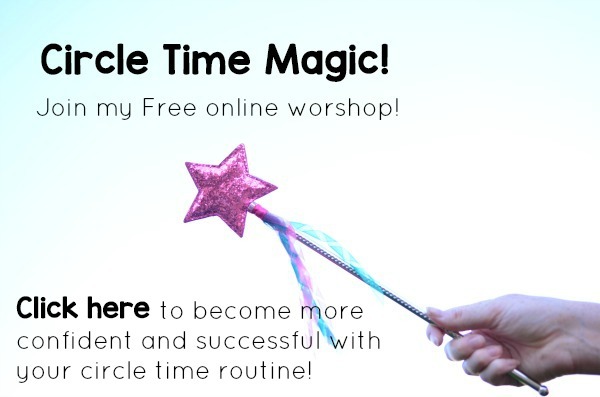 Find out about how circle time is important, how to do circle time, circle time songs, and more! Back in the days that I was going to college, I absolutely would have loved a Circle Time 101 class! Like many of you, I’ve had to learn by just doing it and also by seeing other incredible teachers mentor me in this area. I love circle time now, and it is a very relaxed atmosphere in my own classroom. Here are my own tips and tricks that I’ve learned along the way. Circle Time has numerous benefits and adds incredible value to a class community. It is a time to meet together as a large group, to respect each other’s voices, to practice keeping little bodies in their own space, and to work on following instructions. It is also a time to enjoy one another and to talk about topics directions. It’s even the perfect environment to learn a new skill. A time of welcoming — Simply put, this is a time to make each child feel important and valued. This can be done through a welcome song, talking about who is at school or at home, or even engaging in an activity with our names. This time conveys to each child that this is your class, and we are so happy to have you as a part of it. Include a story — Stories bring the element of literacy, creativity, and also listening skills. Here are our favorite Circle Time stories. Bring Pete the Cat to life by using him as the narrator. Act out the scenes of Caps For Sale . Have the entire class read the story Brown Bear, Brown Bear aloud. Or even put a favorite story on with a book on tape. We love including story props such as puppets and felt board pieces too. Make it musical — The younger the class is, the more movement will be necessary. Include songs with motions. Practice dancing and balancing with bean bags. Hold hands and walk in a circle to the beat, then rotate. Grab some musical instruments and go on a parade. Practice moving slowly and quickly to the tempo of the song. Sing a color song with different colored items while assigning one to each child. Music involves both hemispheres of the brain, so it is such a fully engaging activity which is fun at the same time. Combine stories and music — We love using books with music combined. Sometimes doing this activity alone extends circle time because the children just can’t get enough. These are some of our favorites! Teach something new — Circle time is great for a new lesson in the class. When there is a new activity on a shelf, I demonstrate it during circle time then make it available during the day. We talk about how many friends can use it at once, how carefully it needs to be handled, what to do if someone drops it/squishes it/breaks it/puts it in their mouth, and where to return it when we are finished. Talk about classroom life — Some children can really benefit from hearing about what the day will look like. 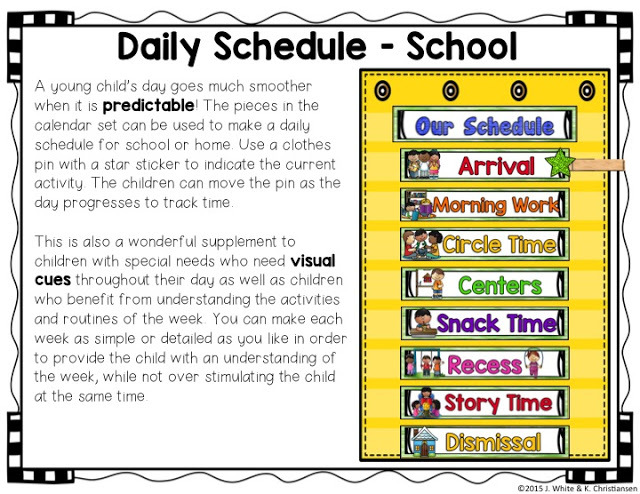 A visual schedule is a perfect way to talk about the events of the day. 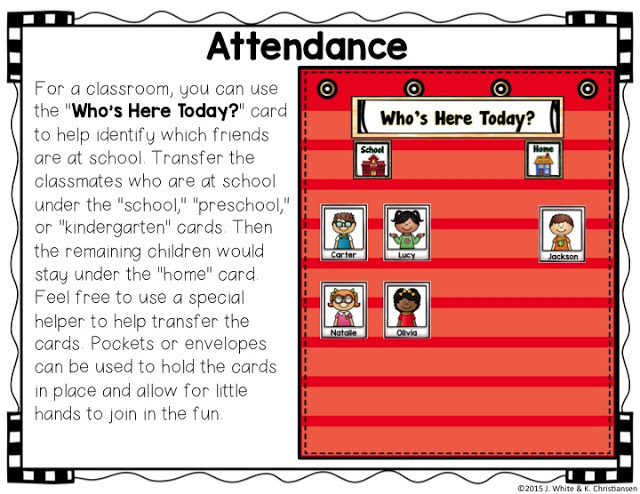 Circle time is also a great time to show who is at school or who is absent. My friend Jamie of Play to Learn Preschool and I have come up with some resources for you to do this. Click one of the photos below to see our entire set designed just for circle time. This is a circle time tip I wish I had known ages ago! We’re not all Mary Poppins with the beautiful singing voice and perfect answers all the time. And for the record, Circle Time was overwhelming to me for several years. I never felt that I was doing it right or that it went as smoothly as I wanted. Then I realized what was wrong. I was trying to be a teacher who I truly wasn’t. Once I found elements that fit me and my personality, I started to become more confident. I would do activities that didn’t focus around me. We did science experiments, dictations of everyone’s favorite color, songs and dances that were on CD, and I especially loved having a strong leader in the class help stand beside me some days. Through time I started to become more courageous and adventurous, but I will never be that engaging teacher who holds a class’ attention with dropped jaws and eyes glued to her the whole time. That’s just not me, but I am happy with what I do offer. What are my best circle time tips and tricks? Provide a boundary for each child’s space, such as a rug or a designated space on the carpet or flooring. Some carpet stores will donate old samples they no longer carry. When you have children who love to talk or try to take the lead, give them that chance. Give them a job to be more involved in a productive way by helping lead a song or holding a story for you. They love to feel beneficial and helpful. Keep the time consistent with their interest level. Sometimes Circle Time is 3 minutes, and sometimes we are able to go 15 minutes. The average time is 5 to 10 minutes. Circle time for children under three years old should be voluntary and not forced (a recommendation per NAEYC). For children who are extra wiggly, provide a soft item to squish such as a squeezy ball or sponge to help them manage their wiggles in a positive way. Stay flexible. If no one is interested in Circle Time, it’s time to move onto the next idea. Use a talking stick to pass to the person who gets to speak. There will be some classes who want to talk all at once on a regular basis, so a visual reminder of who’s turn it is can be an amazing asset. A play microphone works pretty well too. Overall, keep Circle Time fun, engaging, and true to who you and your class are! Oh my pleasure, Connie! Thanks for taking the time to let me know :). Thank you so much for sharing. May I ask if the 2s and 3s can keep their small bodies on a space that you have set for them? How did you do that? Hi Reich! Yes, I did have success with keeping 2s and 3s on their spot. I made sure to do some movement and action songs at the beginning, and I didn’t make them sit long. I was OK if they were wiggly too. I’m more concerned that they sit so that they aren’t touching someone else or sit so that they aren’t blocking the view of their friend. We start off doing criss-cross applesauce, but I know some will not be able to hold that long. Sometimes I would use a motivator for extra incentives. For example, I might give everyone a feather to hold during circle time.